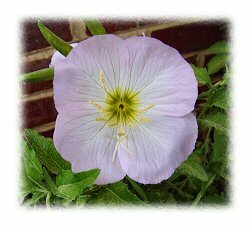 Pink Primroses – Oenothera Speciosa – are sometimes called pink ladies. They mainly bloom from March through July. They were originally native to central grassland areas from Missouri to Mexico, but have become widespread. Although the foliage isn’t very pretty – they remind me of weeds – the pale pink, delicate, sweet-scented flowers are beautiful. The spread by underground runners and will easily seed themselves, to return each year without replanting. Pink primroses prefer full sun and aren’t too picky about soil. If you have a spot where nothing wants to grow, these may be an option. They are tough little plants that don’t require a lot of water or pampering. In fact, too much water seems to make them dormant until things dry out. Be warned that some people consider these plants invasive and claim they are hard to get rid of.